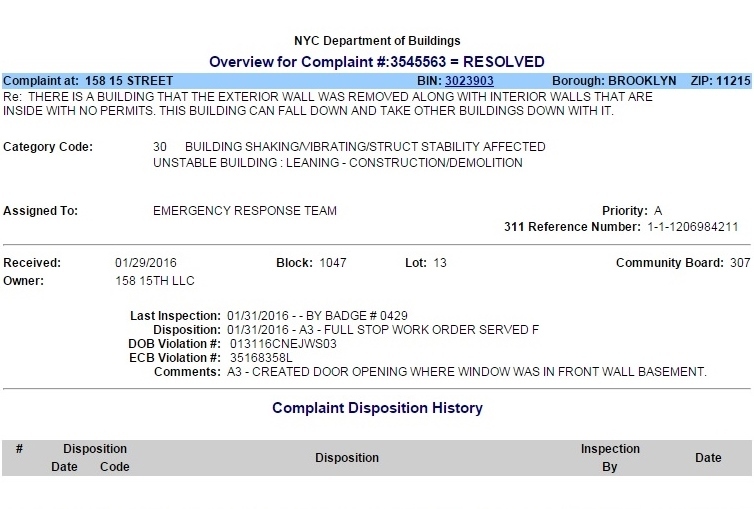 At the end of January a full Stop Work Order was put in place at 158 15th Street, a couple of buildings up from the big development planned on Fourth Avenue between 15th & 16th. Prior to the SWO, alteration/demolition was in full swing on site, with the removal of interior and back external walls. The house was gutted. There were no job actions filed or permit applications on record while this work took place, and nearby residents were justifiably alarmed. Strangely, no mention of the other, major "work" at the site. 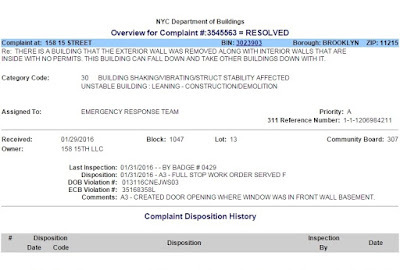 Since the illegal work was stopped & the SWO put in place, after-the-fact permits-in-process have been issued(2/8) for "INTERIOR GUT RENOVATION AND REPLACEMENT OF FLOOR BEAMS IN CONJUNCTION WITH ALT 1." It's not evident from the photograph above, but if you're on the street, you can see clear through the top front windows to the backyard - the rear wall is completely gone. Sadly, this kind of stuff is all too common. I know many people who've been impacted by neighboring, often adjacent construction malpractice, and have suffered the emotional stresses & financial anxiety caused by structural damage to their homes. This goes on city-wide. How about the City throwing the book big time at developers that display such indifference to building regulations, the safety of workers on site, and the safety & sanctity of neighbors & their homes? The current levels of fines imposed on errant developers (when they're actually imposed at all) are completely inadequate.